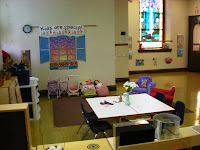 I have been very busy trying to update the block and family center at our school. For the family center, if you remember, the course I was taking recommended having a specific entering and exiting point. Our family area was wide open, no real defined boundaries. I tried to take what we have and create a specific place for it. We used to have all of our kitchen "appliances" along the wall. I moved these to create a new "wall." 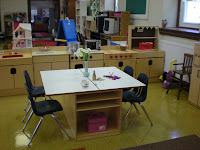 I also separated the area into a kitchen area and a "living room" type area with seating. I bought two chairs for the seating area. On my wish list is a small desk and a table for some books. There is still not quite a "definite" entering and exiting spot, but I have narrowed it down and made it look like it's own specific place. The block center was another huge undertaking. We have always had our wooden blocks in a big bin--they didn't get played with much. 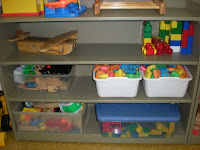 The course talked about putting them on shelves with markers on the shelf for when they need to be put away. I went to the craft store and bought some foam pieces with a sticky back. I cut the shape of the block out of this foam and stuck it on the shelf. 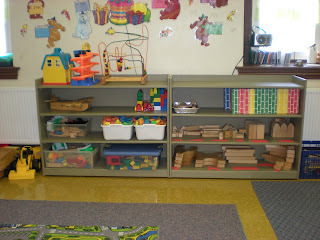 One shelf area contains all the wooden blocks and our cardboard "bricks." The other shelf contains more of our connecting block. 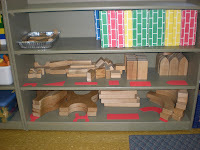 Here on my wish list is a new supply of wooden unit blocks. I really didn't know we had so few until I saw them on the shelf. I think both areas worked out really well. They look so nice and inviting. I hope the children enjoy them. looks nice. You have a giant home/kitchen center! You hit a lot of my magical preschool :) Thanks for stopping by and posting a comment. It looks awesome! Great job. 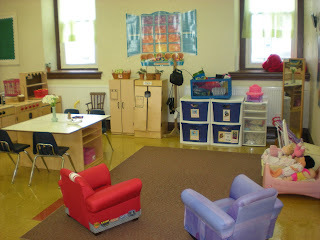 Good idea to have the blocks where the kids can see them. Have a good day! Peanut is still adjusting- will take time. Just a few tears this morning. She was actually out sick Mon. and Tues. I'm hoping that she is having a fun day! 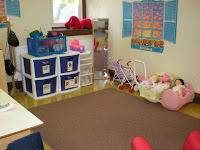 I wish my daughter had you for a teacher - your room looks fantastic!